As you know, I love me some kbeauty! NoTS is a Korean skincare brand that focuses on using natural ingredients, eco-friendly packaging and using the best scientific formulas to provide your skin with what it needs. Since I love good ingredients, there was no way I was passing up the opportunity Q-Depot gave me to try this. Q-Depot is an online kbeauty merchant based in Korea. They offer free shipping for any order over $69 which is pretty awesome. Especially when they're shipping from Korea. In my experience the shipping charges when buying from online retailers in Korea can become almost more expensive than the product itself! If you don't hit the $69 mark, shipping starts at a flat rate of $2.99 depending on your country. Everything ships from Korea so it can take some time to reach you, depending on the shipping option you choose. They have great brands like Banila Co, Missha, The History of Whoo, Secret Key, Leaders, Tony Moly, etc. They don't have Hope Girl or I would buy a stash of the 140 Super Lash mascara from them for the free shipping. If you're looking for cruelty-free brands, Q-Depot is very proud to offer Etude House, Laneige , Mamonde, Sulwhasoo , IOPE , Hera, Innisfree and of course NoTS. I've used NoTS in the past and had a good experience. I also love trying new mists. I'm big on hydration and since my skin tends to run on the dry side, I need something that works. That means a fancy name and an expensive price isn't going to cut it. Far too often some of these $300 skin creams contain none or very little of what the skin actually needs and can absorb. Here's the thing about mists. Spraying straight water on your face and then letting it air dry can actually dry your skin out more. You probably know this. It's one of the reasons I've been so "meh" about the Evian mists. I don't feel like they tell you enough about how to use it. 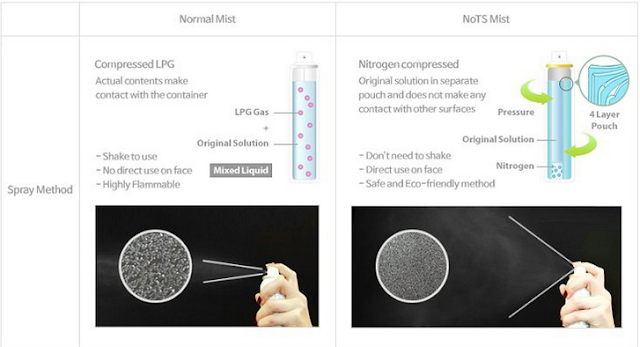 When using a mist, you don't want the water to evaporate on it's own. The best way to use a hydrating mist is to use it in conjunction with a moisturizer. So spray your mist and then immediately trap all that hydrating goodness with your moisturizer. Using a moisturizer with hyaluronic acid in it on top of your mist is going to be plump skin magic. Trust me. This is more important when using straight water mists. 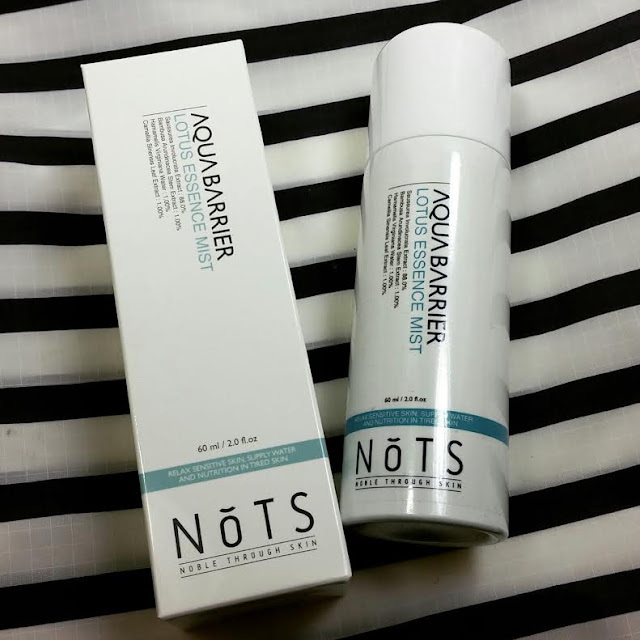 NoTS Aqua Barrier Lotus Essence is not straight water so you have added options when using something like this. If you need to refresh your makeup in the afternoon, you should use a mist like this. 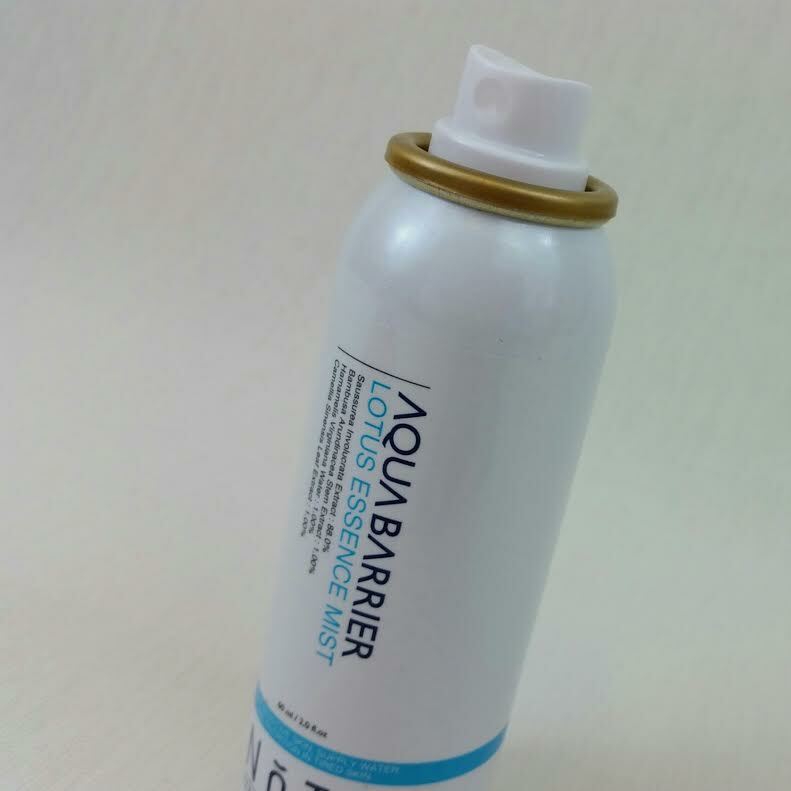 You can use the Aqua Barrier Mist as part of your skincare routine with your moisturizer but you can also use it on top of your makeup. The sunscreen/makeup barrier will prevent that extra drying to your skin and will also give a boost to makeup that's getting tired. The Aqua Barrier Lotus Essence Mist has a base of 88% Snow Lotus Extract. That is a whopping portion of antioxidant! Snow Lotus grows in the high mountains of Asia (think Batman Begins and that blue flower he had to get to gain entrance to the monastery) and has been used for centuries in traditional medicine where it's grown. It's main proven benefit is it's anti-inflammatory effects. It also has bamboo stem extract, witch hazel and green tea extracts. These are a combination of free radical fighting antioxidants and anti-inflammatory, skin soothing ingredients. Since NoTS not only focuses on cruelty-free, natural ingredients but also eco-friendly packaging, they have one of my favorite systems of application ever. Many times when you receive an aerosol mist, the nitrogen and other properties needed to actually spray the bottle are incorporated with the product itself. 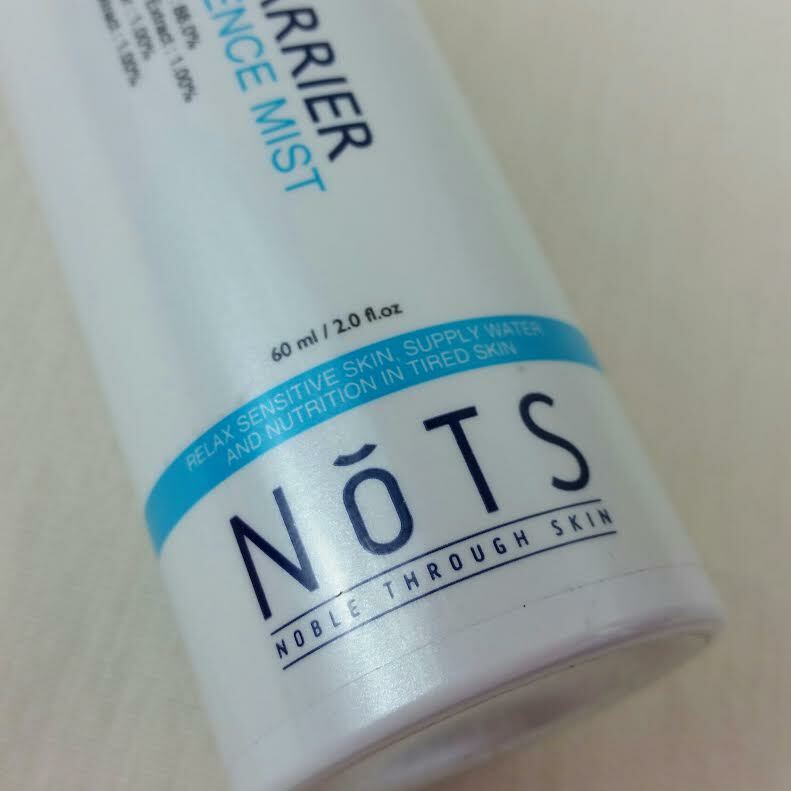 NoTS has used a canister that separates the product from what's needed to force out a spray! You can hold this upside down and it will still spray beautifully. One thing I look for in a product like this is a light, even mist. I don't want something that's going to spray drops so big that I have rivulets running down my face. Been there, done that. Not pretty. It also tends to make your regular moisturizer smear thinly all over the place. A regular pump spray tends to have bigger drops. The NoTS Aqua Barrier Mist sprays a cloud of tiny droplets that lay over the skin perfectly. It's such a fine mist you can't even see it. The cloud is a little on the large size so it can get in your hair but I tend to have that issue anyway because my face is small. The immediate effects on both on the skin and over makeup are very cooling. Since the mist is so fine, it makes putting on moisturizer after it very easy. It's also great over makeup because there is zero run off. I also love how smooth my face feels after I apply this on top of makeup. If I could photograph smoothness, I would! I usually use this in the afternoon and evenings when my morning moisturizers are starting to fade in effectiveness. It gives an immediate perk to my skin. It's a nice size and is easy to port around in a handbag for that afternoon refresher. I should be clear and say that this is not the same thing as a makeup setting spray. On top of makeup this works best mainly as a refresher to give your face make up a little more of a longevity boost. My makeup can dry out fast because of my dry skin and I feel like this mist rejuvenates my makeup and keeps it from going flaky. Or if it is flaky, this nips that in the bud. It has a light scent that dissipates quickly. I'd say it was more herbal than floral because it's got kind of a tangy-ness to it, for lack of a better word. It's not overpowering and you're not going to smell like a rose. Thank goodness. Some of the mists I have are so scented, I don't like to use them. Mists aren't for everyone. I love getting a little pick-me-up and I have fairly dry skin so I tend to need it. This NoTS version is one of the best I've used for evenness and fineness of the actual misting. (Sorry TCFS, it's true). I'm really happy with this NoTS Lotus Mist. It definitely beats out every mist I currently have (and there's a lot. Six, at least). I love the fact that the scent is light, the mist is fine, you don't need to shake the container and the ingredients are all cruelty free. 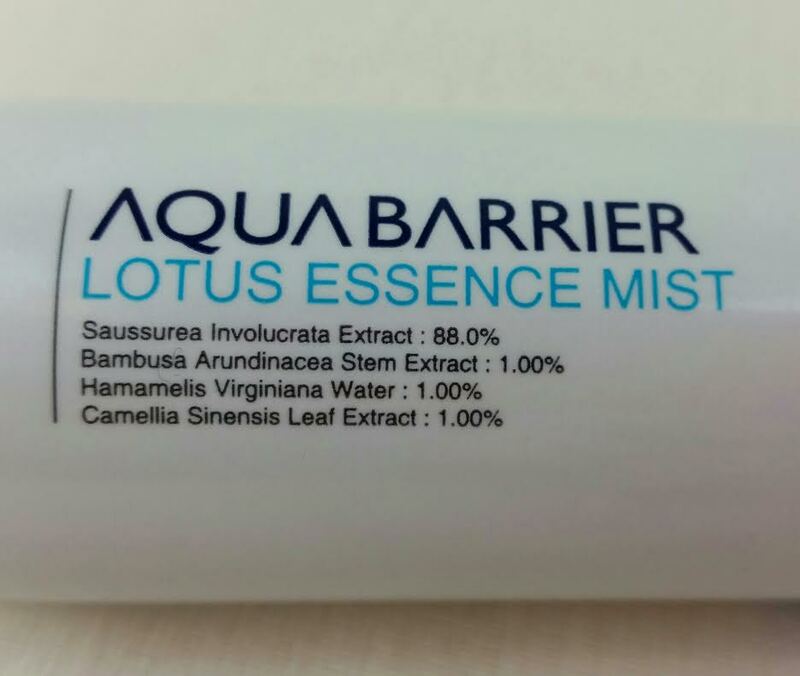 If you would like to try this NoTS Aqua Barrier Lotus Essence Mist, you can pick it up at Q-Depot for $20.95. It's currently on sale from $23. They have tons of things on sale right now, like all four BanilaCo. Clean It Zeros, Leaders Snail products and even Mamonde! That free shipping at $69 is screaming at me because they have so many brands I love and respect. It looks like they are also having a promotion right now that gives you a $5 to spend when you create an account and make an order over $69. Do you have a mist you love? I've tried a LOT and NoTS comes to closest to being perfection. I think the only thing that would make it better might be a version with different ingredients. Mmm, snail in a mist!